Every Monday I’ll post a new short story here, based on an image somebody out there has sent me. Welcome to the 52. There’s been a bit of a hiatus around here, because of reasons, but we should be back to normal for the next couple of months at least. This week I’m collaborating with Amanda Martin for your reading pleasure. She sent a picture of the Petronus Twin Towers in Malaysia, which entirely be coincidence I was able to visit last month. They’re majestic in their own right, but it’s difficult in light of modern history to appreciate them in isolation. 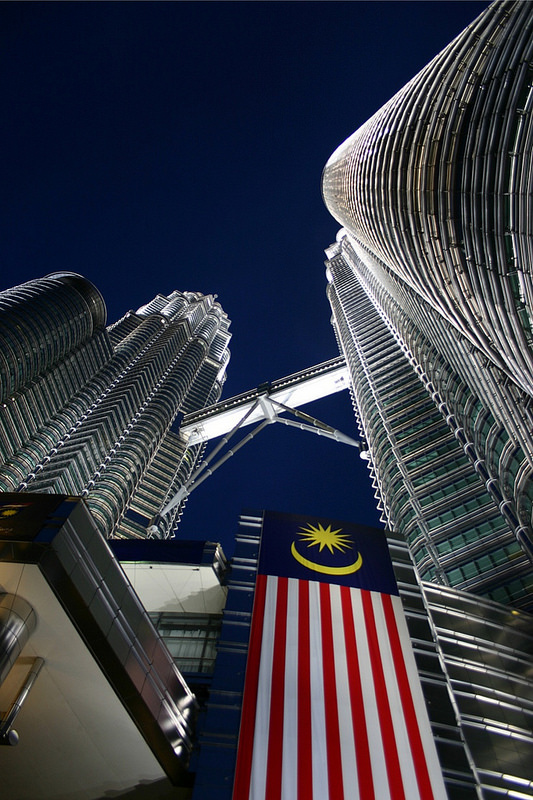 The Petronus Twin Towers are Malaysia’s modern jewel. Those who live in Kuala Lumpur and turn their eyes to the sky of a night draw comfort from their pale white glow, and are filled with strange pride that their city hosts the tallest twin towers the world has ever seen. Visitors fly in from across the globe just to gawp at them. Kevin barely glances up as he returns to work that September evening. The smoggy, twisted streets are crowded, and he does not appreciate having to go back to the office for a late night conference call. While Tower One houses the behemoth that is there Petronus Group, Tower Two is rented out to a host of multinational companies, Kevin’s included. Life in Malaysia suits and fascinates him, with its heady layers of exoticism, technology, and squalor. The occasional requirement to touch base with his masters in the US is only cross he bears in grudging trade for the year long opportunity to work there at the company’s expense. Walking up to the plaza on which the towers stand, he casts a glance skyward. No matter how often he sees them, the twin sentinels always impress him with their serene beauty. Were it not for the double decker skybridge shackling them to one another like conjoined twins, they would each seem like a vast syringe poised to vaccinate the clouds. From the top floors it is possible to see the stars, though from ground level that can be difficult to believe. The banks of pollution make the sky a flat void at this time of year. In the absence of constellations, the towers define the sky. They are vast antennae, waiting to capture signals transmitted on a scale beyond human comprehension. As ever, tourists surround the ghostly structures, craning their necks as they try to find ways to capture the whole edifice in a single snapshot. All nations mingle as one in the attempt, a ring of flesh around the towers that grows loose at the edges and bunches like tense muscle at the entrances to the bright shopping centre at the base of the structure. Security guards wander among the visitors, hunting out the pickpockets who float up from the city’s dark corners to prey on those made careless by wonder. With so many faces cast to the heavens, sly hands have open access to pockets and purses. Kevin is crossing in front of the mall’s guarded doors at 20:30, weaving between shoppers and tourists, when his skin turns clammy and his pulse quickens. Claustrophobia plagued him as a young man, but he has not had a serious attack for five years or more, a period which not coincidentally matches the length of his relationship with Tasha almost exactly. He makes that link for the first time. They have not seen one another since her visit three months ago, and her absence is a dreadful ache. She is almost exactly half a world away, twelve hours behind him in New York, and will be arriving at her own workplace at the very moment. Tasha is his soul mate. They are connected. Closing his eyes, he fights the need to get out, find air, find space. It doesn’t work, and so he tries and fails to swallow it away. It will be better inside, he thinks. Away from the crush and din of the crowd he will calm. The din has vanished, and when he opens his eyes and looks around at the crowd he realises that he is not alone in his strange trepidation. Everybody has fallen silent. Most are walking away from the building, an almost thoughtless drift that their expressions suggest they are not conscious of. They stare up at the towers. Allowing himself to look up too, he understands that it is not the towers that are so fascinating. It is the flat, dark sky and the thing that it conceals. That there is a thing approaching, borne of nightmare, is something he believes to be true even though he does not know why. Tasha stops him from backing away, putting space between those luminous towers and himself. It had occurred to him moments earlier that when he was finished with Head Office, he could call her at her desk and bid her good morning. Kevin loves Tasha a great deal, and it is that which makes him force his unwilling legs onwards to the staff entrance at Tower Two. It is not a pleasant journey, nor an easy one. Every instinct he has wants him to run away. Logic tells him otherwise, for nothing is happening, nothing is wrong. Logic is simply a means by which a person can be wrong with authority, but he lets it bully him into the building anyway. Inside it is better. He has the open plan office on the sixty-first floor to himself, save for a solitary cleaner who cleans each surface with a slow precision borne of tiresome routine. Kevin has a desk beside the window, and stares out as his managers in New York drawl on about market share and next quarter predictions. While making reassuring noises at appropriate moments he watches the dancing fountains far below as they arc and spray in time to music he cannot hear. The coloured lights playing through the water are hypnotic, and make his eyelids heavy. At 20:46 something vast fills his vision, even though it is not there. It has such weight and size that it gives the illusion of travelling very slowly, even as it rockets into the building. Except it doesn’t, because it does not exist. A vast, encompassing roar does not deafen him. Screaming, he throws himself to the floor, away from the window, and a blast of shattering glass and steel does not shred his face and clothes. He lifts his head, sure that tremors should be rocking the building, not understanding how everything can be so still. The telephone dangles on its cord over the edge of the desk, and he can hear tinny concern from his boss. Although he wants to pick up the phone and make some attempt at explanation, he cannot bring himself to step closer to the window. There is danger at the window, even though there isn’t. The cleaner has gone. Kevin is alone. Easing across the carpet, as though the wrong step might cause something to implode, he makes his way towards the door. He is terrified, hyperventilating, and does not know why. At 21:02 Kevin pushes open the fire door and steps into the stairwell. For ten minutes he had stood by the elevator, willing himself to press the button to summon the car but unable to make himself do so. The lesson was too strongly ingrained. Elevators are to be avoided in an emergency. There is no emergency. Nothing is wrong. He wants to go back to one of the offices and call Tasha, but the need to get out is stronger. At 21:03, as he makes his tentative way down to the floor below, he feels the echo of an echo of a second collision. The building doesn’t move at all, but his body feels it anyway, as though somebody has pulled the stairs out from under him. Losing his feet, he topple backwards, landing painfully on his tailbone with a cry. Instead of standing, he huddles with his head in his hands, not knowing how to fight back the incomprehensible sensations wracking him. For few moments it is peaceful, and then something catches his throat. He coughs, which makes it worse. Now that he has started he cannot stops, and he hacks and splutters as phantom smoke fills his lungs. Although the temperature does not change at all, he begins to sweat. With his eyes streaming, he makes his way back up the stairs on all fours like a parched man in a desert. Only when he reaches the corridor at the top and closes the door behind him does the burning cease. Back in the office he huddles beneath Sayid’s desk, still too frightened to approach the windows and the sense of lethal void they represent. For the longest time he cowers, hugging his knees to his chest. The scale of what isn’t happening overwhelms him. There are no coping strategies to deploy, no defences to erect. It steamrolls over him. For forty-five minutes he weeps, a swirl of regrets and longings. Tasha looms large over him, but when the taste of phantom smoke started to permeate the room, drying his throat and making him gag, it is not his lover that he calls. Dragging the phone off the desk by its cord, he dials his mother like the frightened boy he has become. The call goes to the answering machine, and he babbls his love, and his regret, and tells her he is sorry even though he does not quite know what for. Half a world away, she does not hear his muted voice in her hallway because she has the volume on the television up as she watches the world end. Kevin stops talking when he can no longer breathe. The room is a blur seen through burning tears. He punches the underside of the desk as sweat drenches him, then claws at his throat and eyes as tiny choking noises spill from his lips. It is too much. It is unbearable. Crawling out from under the desk, he staggers to his feet. The windows are dark patches, and he stumbles towards them, picking up speed, willing to die for just a touch of the cool Autumn air. He is on the sixty-first floor, but that has ceased to matter. He needs to get out. He needs to breathe. He hits the window at a sprint, and if it had blown in earlier then he would plummet into the sky and drop like a rag doll, full of terror and regret and relief. The windows did not blow in earlier, and he bounces back from the reinforced glass with a sick thud that drives stars through his mind. It is 21:59, and he knows that the floor has dropped away, and there is rubble and crushing and hot death awaiting him. The floor is just the floor. There is a nauseous pounding across his forehead from where he hit the window, and the dull heat of his self-inflicted scratches on his neck and throat. When he raises his hands so he can see them the notes the blood beneath his fingernails. But it has ended. Whatever it was, it is over. Nothing has happened. Nothing is wrong. Weak, he drags himself to his feet. The room spins, but that is only because he has hit his head. Limping to his desk, he lowers himself into his chair, retrieves his dangling handset, and punches Tasha’s number. Shaken and in pain, he wants her voice to soothe him and make the world a solid place again. There is no answer, but that is not possible. If she were not at her desk then the call should route to the switchboard. Instead he has nothing but an ominous single tone to listen to. Kevin squeals with need and high-pitched frustration, then hangs up and dials again. When he gets the same result, he tries again. Still nobody answers, his heart kicks up a little warning. Something is wrong. He is calling the World Trade Centre in New York City. It is 2001, and the switchboard is manned twenty-four hours. It is not possible that nobody is there to answer. He tries over and again, but it will not be until many hours have passed that he realises he has already taken the last message Tasha had to send. Amanda Martin has been an artist, photographer, marketing manager, consultant, web designer, and teacher. She currently splits her week between writing novels and raising her children. You can find out more about her novels and story collections at her website, or track her down on Twitter. A rather blunt and to the point affair this week. I shall save subtlety for another time. If you enjoyed the story, please do tell your friends to come and read it too. Nobody will ever know it exists if you don’t. As ever, well done Richard. I didn’t see it coming at all. Excellent. Thanks, Richard, it’s a great story!